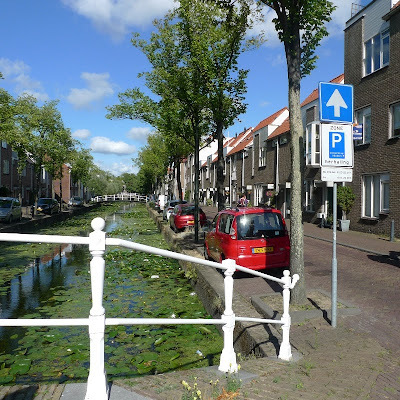 Delft, the Netherlands, is a rather venerable town: think of its medieval origins, its ties to the royal house, its rise as a trading power in the 17th century, its artists, writers and scientists. But its 100,000 residents don't think about that stuff too much while going about their daily business. For my parents, a lot of that business was done by car. 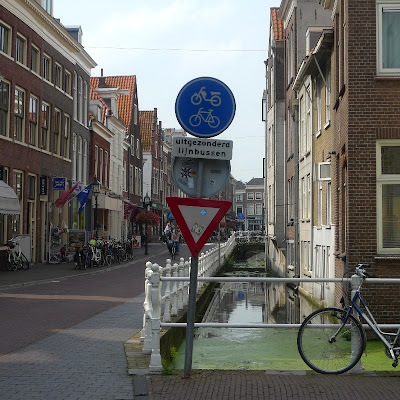 When I was growing up, my dad would happily negotiate the narrow canal-side streets, park on the very edge of the canal, or else on the expansive market square between the New Church and City Hall. Buses would pile into the same market square to disgorge hordes of tourists following umbrellas. Trucks would come in for deliveries, causing traffic jams in the one-way streets. I didn't realise it at the time, but it probably stank of exhaust - none of it unleaded. 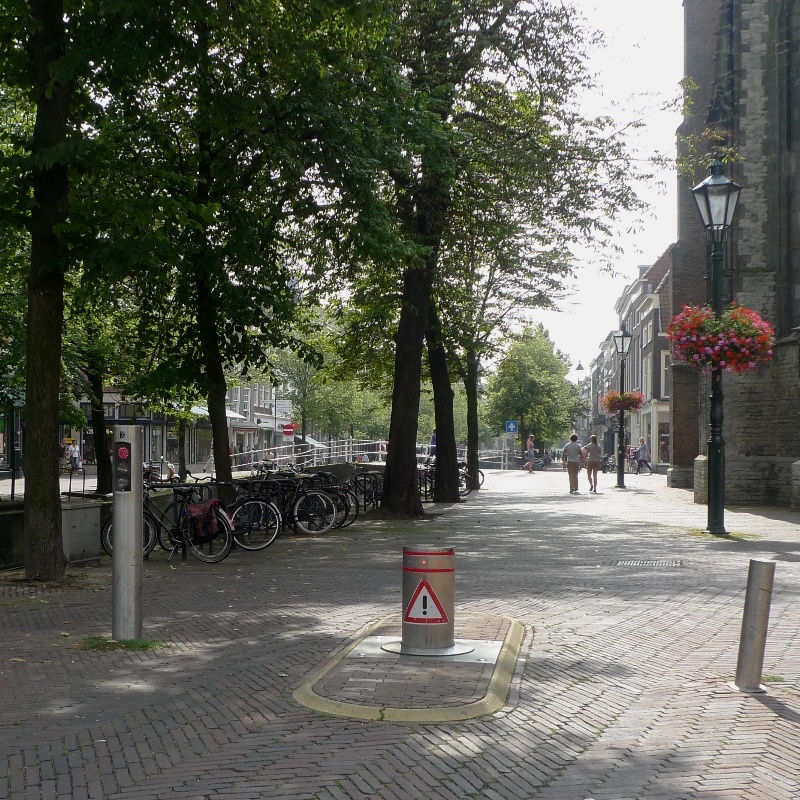 In the late 1970s, the city of Delft decided to do something about the noise and the pollution. Since then, it has been a pioneer on a long but inexorable path to reclaim life from the effects of car traffic, especially in the medieval city core. It started innocently enough: the city centre was divided into four quadrants, and you couldn't drive from one to the other directly, you had to drive around. You could still bike everywhere. Then, some streets (mostly those with shops) were declared pedestrian zones. Other measures were put in place to put private cars in the position where it belongs: as a transportation mode of last resort, in as much of the city as possible. 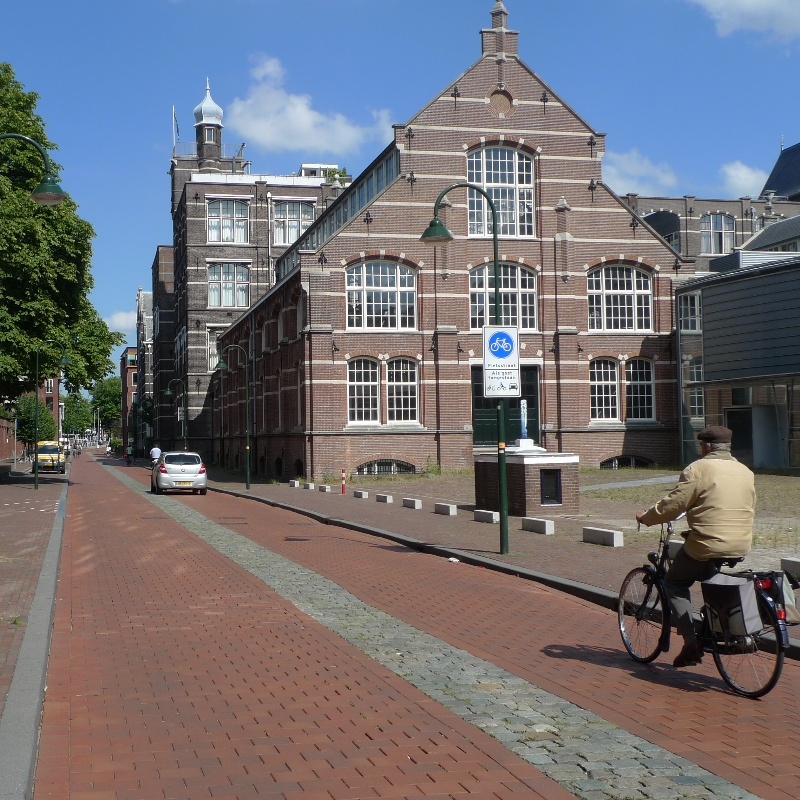 Over time, Delft was transformed into a much more pleasant place, more vibrant than before, safer for pedestrians and cyclists, and with much lower carbon emissions. The cool thing is that through all this, the city has remained accessible for everyone. While cars have certainly taken a second place, they are by no means banned entirely. 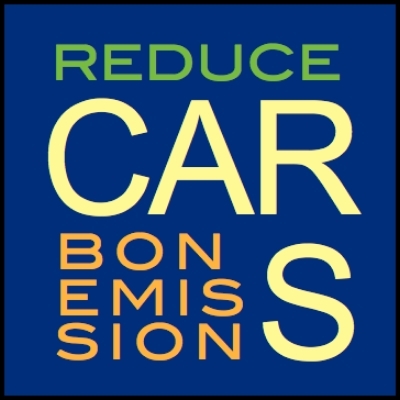 The city has worked very hard to find ways to share its roads safely, while giving priority to green traffic. Here are ten policies that help make it happen. One simple and effective way to send the message that cars are not welcome, is to provide few or no parking spots for them. A lot of time and gas gets wasted in looking for a parking spot; Delft has pre-empted that by building two parking garages just outside the city core. Parking was banned from the central market square, reclaiming the vastness of the medieval square. To park elsewhere in the city centre, you need a resident's permit, and the willingness and skill to parallel-park your car into a canal-side spot - without railings. I should add there are always some spots available. Many of Delft's shop-lined streets and plazas are pedestrian zones. However, these have a twist: where so indicated, bicycles are allowed, as long as it is understood that pedestrians have right of way. Electric bikes and mopeds move too fast and are banned from pedestrian zones. Not inclined to exclude anyone, the city has installed handicapped parking spaces nearby pedestrian zones, often closer to the stores than the spaces for delivery trucks. 3. Separate sidewalks and bike paths. This goes almost without saying: sidewalks and bike paths, physically separated from each other and from the car lanes, are amply proven to be the safest for pedestrians and cyclists. 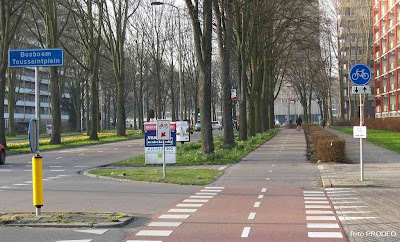 A recent Dutch invention is the street with two-way bicycle paths on both sides of the street. 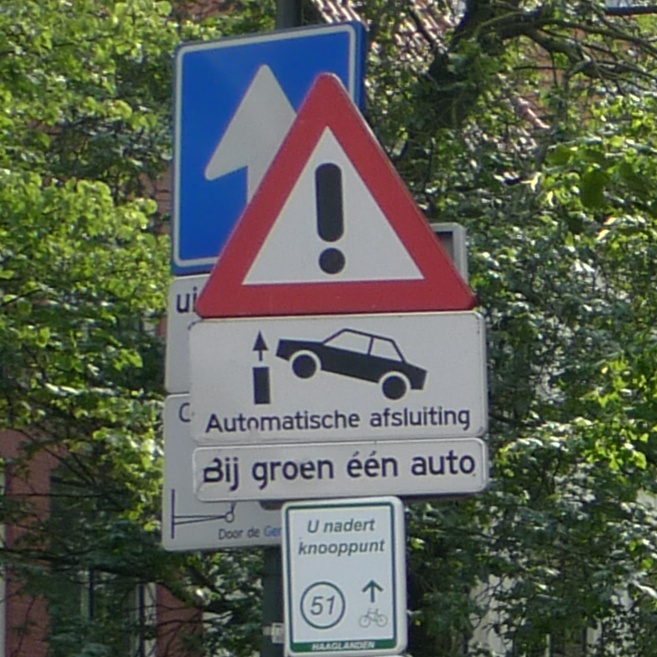 The photo (by Prodeo, for PolitiekDelft) shows the inverted triangles painted on the road, indicating that cyclists on the bike path have right of way over car traffic crossing the bike path in either direction. The two-way bike paths are very popular with cyclists because you don't have to cross a busy street unless you really have business on the other side. It also causes motorists to slow down even more when approaching a bike path, making it safer for the cyclists. 4. Shortest path from A to B is a bike path. 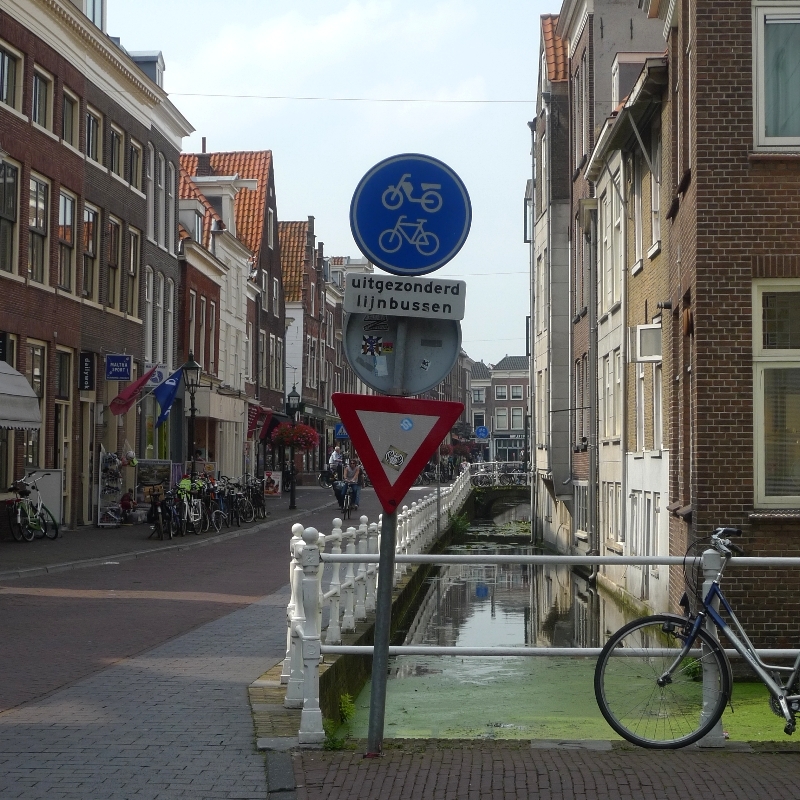 Many of the narrow streets are one-way for car traffic only, but can be traversed in both directions by bike. The photo below shows the No Entry sign modified by "bicycles and mopeds excepted". 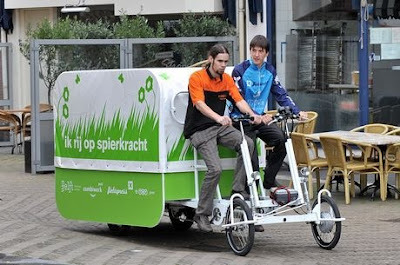 Riding on this policy (no pun intended), is Delft's pilot programme for parcel deliveries inside Delft by bike, FietsXpress. The logistics is provided by alumni of the Delft University. Its couriers claim they can deliver packages faster than a van; they are certainly quieter and greener. The trailer says "I run on muscle power", the way city buses say "I run on natural gas". The round blue sign with the bicycle indicates a bicycle path: those sections of the road that are reserved for bikes, and must be used by them. 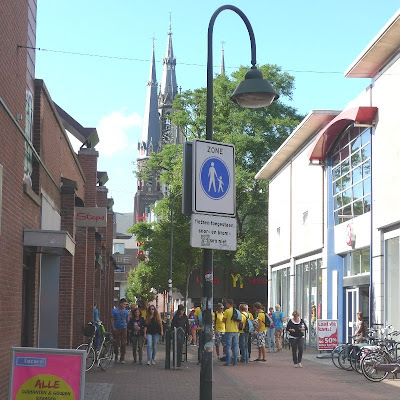 The additional designation "Fietsstraat" (bicycle street) indicates that the whole street is primarily reserved for bicycle traffic. Mopeds, motorcycles and cars are still allowed, but "as guests". The wording is chosen carefully: where you are a guest, you are expected to be on your best behaviour. Sure enough, on streets like this you often see a car patiently crawl behind some cyclists until the opposite lane is clear to pass. The friendly wording is backed up by a law stipulating that in case of a car-bicycle accident, the driver of the car is held liable until proven otherwise (but " proven otherwise" almost never happens). This law is particularly strict when the cyclist is under the age of 14. 6. Public transport on bicycle streets. In order to maintain full accessibility for all, you do need some motorised traffic. Not everyone can get around on a bike. City buses have routes that go right through the city, where on occasion they have to encroach on bicycle streets. For these routes they tend to use smaller buses which are more versatile. The sign below indicates a bike path modified by "Scheduled buses excepted". In principle, the rule of thumb is that public transport has right of way over all other traffic. But in practice, bus drivers share the road with everybody else, and are generally particularly careful around bikes. Even outside the city core, some of the thoroughfares have been modified to restrict car traffic. 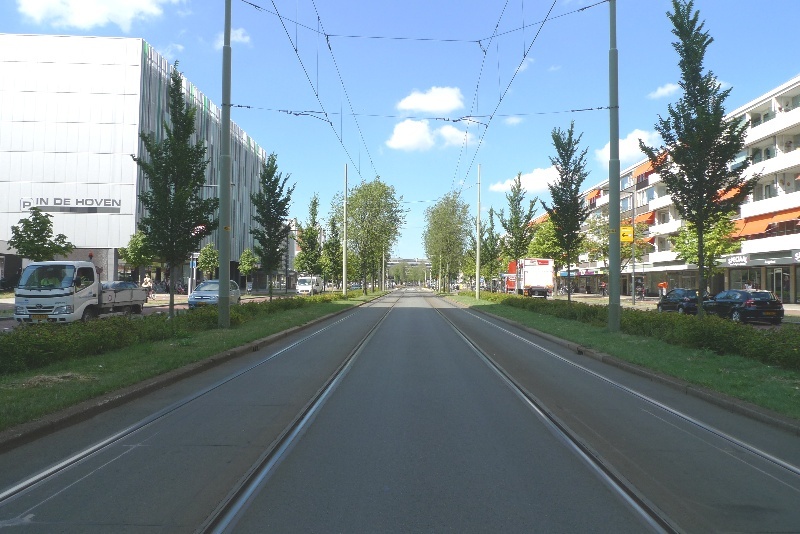 Where there used to be two or three car lanes with a berm, now there might be one car lane each way, a wide sidewalk for pedestrians, bicycle paths accomodating two-way bike traffic on both sides of the road, and a two-way bus / tram lane in the middle of the street. For the handicapped and the elderly with special mobility needs, there is RegioTaxi, public transport that takes you from door to door. Their modified buses can accomodate wheelchairs and other mobility aids. Because you share the ride with others, it's less expensive than a taxi. But if you have a demonstrated need for RegioTaxi's mobility aids, you generally qualify for the discount that makes it almost as inexpensive as a regular bus ride. RegioTaxi buses tend to ride on the cleaner natural gas. 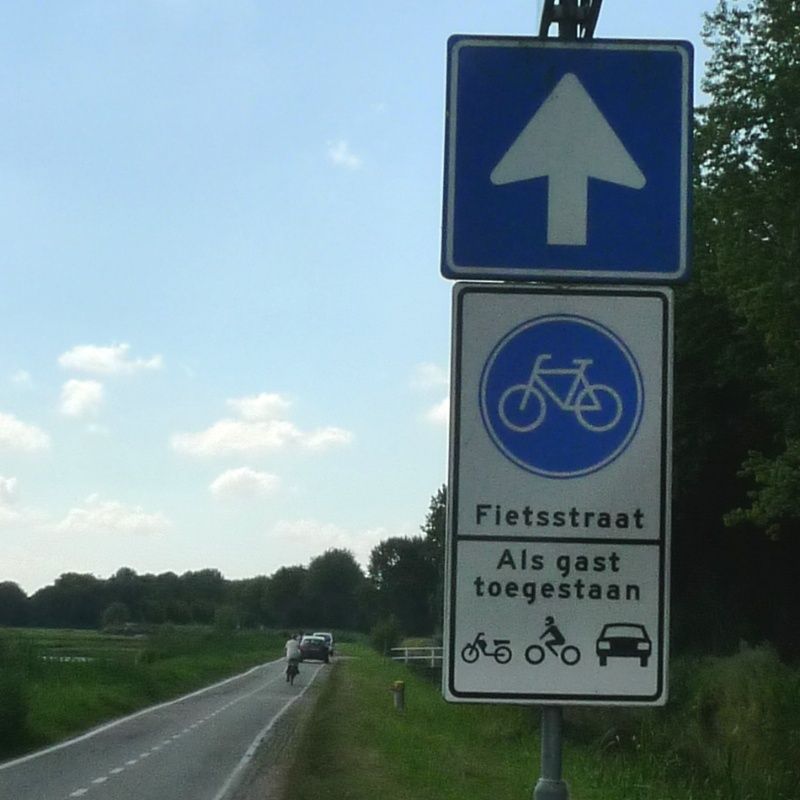 On roads well outside the city, bike lanes are wide and car lanes narrow. And when the Dutch say "narrow" they aren't joking. Indeed, many more rural roads that don't see much car traffic provide width for 1.2 cars, while the bike lanes, indicated clearly by the red surface, take up nearly half the road. The car in the photo above is about the size of a Mini: not large. 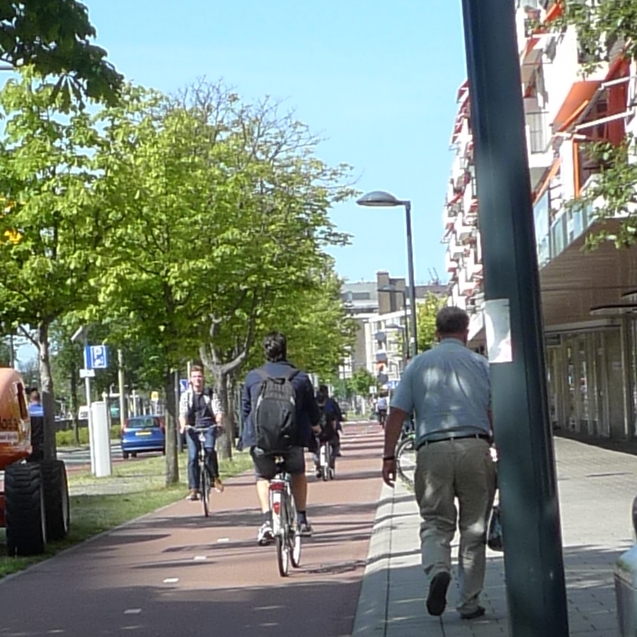 In order for it to pass any car coming from the opposite direction, one or both cars would have to encroach on the bike lanes, where they are allowed - as guests. I should point out that they haven't actually made the road itself narrower. But where it used to be all grey asphalt with a single dashed line down the middle, now they have painted those bike paths' red surfaces on the side to indicate cyclists' right of way. It's the quickest and cheapest way to modify a street to make it much safer for cyclists. On some streets, car traffic is banned with the exception of city buses, RegioTaxi, delivery trucks (with strict size and emissions restrictions), and a very small number of private cars (for instance, those belonging to residents). 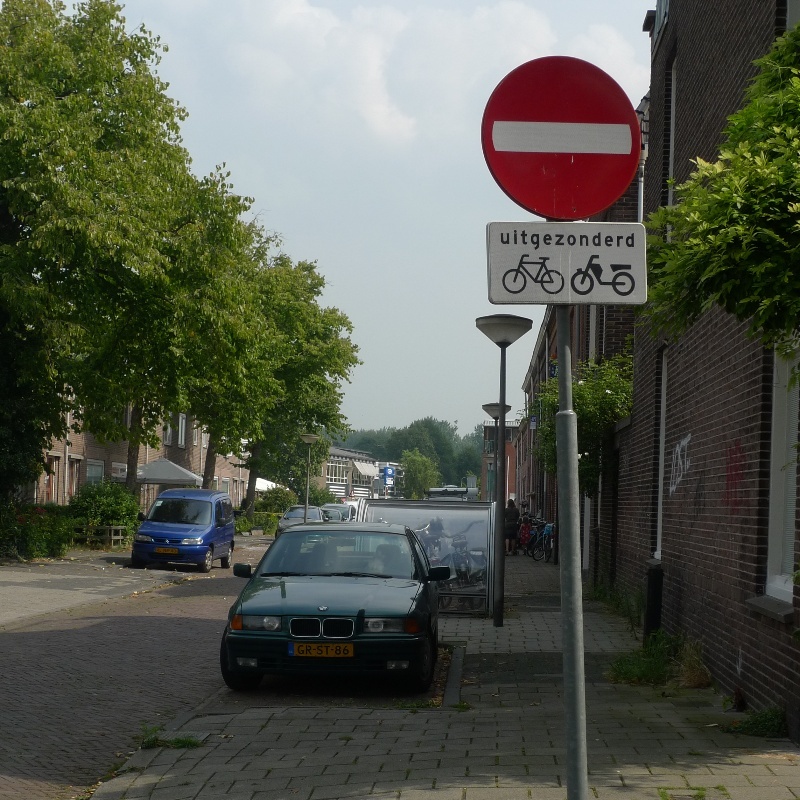 Access to these streets is physically restricted by a line of steel posts, spaced far enough apart to easily let through bicycles and pedestrians. 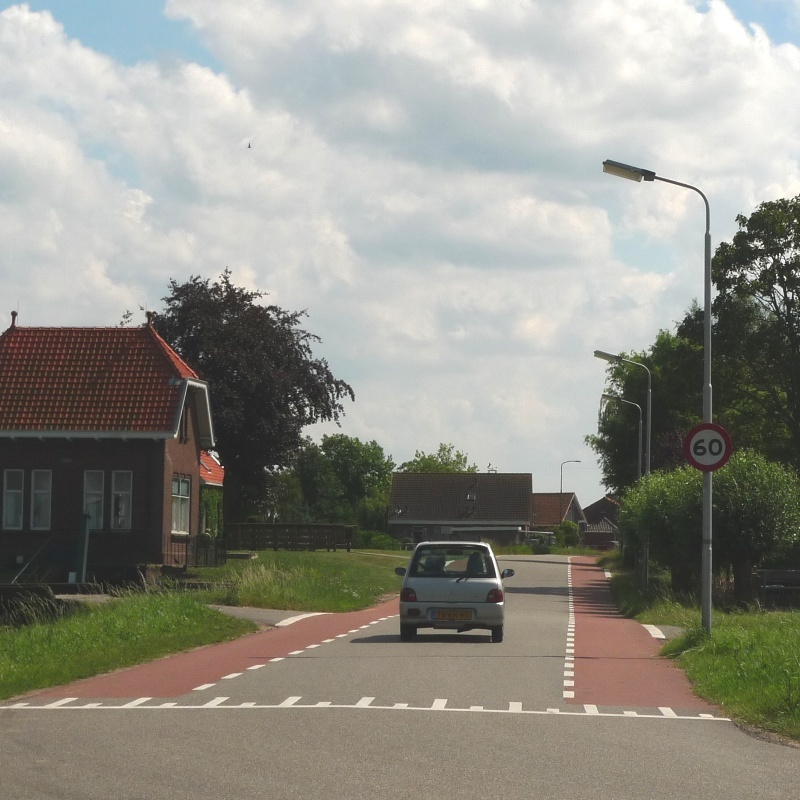 A fat pole in the middle of the lane can be lowered to give access to authorised car traffic. These are operated either by an access card, much like in a parking garage, or else by a remote operator, aided by on-street cameras. A general warning sign (the red-rimmed triangle with the exclamation mark) is augmented by a graphic warning of the dire consequences of trying to run one of these unforgiving poles. It is telling that the Dutch have chosen to call the areas that fall under these policies not car-free zones, but car-sheltered: "autoluw". The Dutch word "luw" has a special connotation as a quiet shelter from wind, which in Holland can be very forceful, and loud, sweeping all before it. It's an acknowledgement that yes, for some things we really need those cars. Just not for all things. What a wonderful insight into the possibilities of urban planning to make a city cleaner and safer. I just wish there were more places like that in the UK, thank you for sharing. Ask for it! Take the time to find out how you can help, by signing a petition, joining a cyclists' coalition, or voting for proponents of greener traffic. The dominance of cars won't go away all by itself. It took Delft several decades to take back the city, step by step. Great ideas! I love the way Dutch and Belgian towns lay out their cities. We could learn a lot! Thanks for sharing - very interesting ideas!